What do y ou do when you want to build a house and don’t know how? Why, turn to YouTube! That’s exactly what single mom, Cara Brookins, did back in 2008. After getting out of an abusive marriage with her four kids, she realized she couldn’t afford a house large enough for all of them. But she did have enough to build one if she didn’t pay for labor. the catch? She had no idea where to even start. So she and her four children taught themselves everything they needed to know by watching YouTube tutorials. The result? 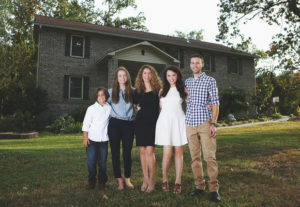 The beautiful 3,500 square foot house you see pictured behind them.